State of Network Security: New Research from ESG and the Implications for IT The Enterprise Security Group (ESG) recently ran a research survey on the state of network security. The survey, commissioned by Tufin, presents compelling results that require network security teams to plan ahead, such as: 86% of IT decision makers responded that automating network security operations is critical or very important for their organization, and yet 65% of them are still using manual processes to implement or modify network security controls. 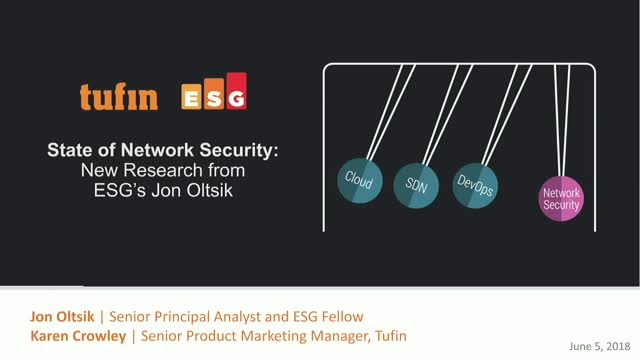 Join ESG’s Senior Principal Analyst Jon Oltsik and Tufin’s Senior Product Marketing Manager Karen Crowley as they review the research and share insights into securing today’s hybrid networks.